IT WAS a pleasure to catch up with our old mate Ian "Scruffy" Marsh from Sydney near Avon Downs on the Barkly Hwy in the Northern Territory. He tells us that after a lifetime on the road he started out with Scarcellas back in 2007 doing mixed bags of trips out west for the Darwin road trains and up and down the east coast, with odd trips to Darwin until he decided in 2009 to give a local waste recycling job a go. But he started itching for the open road again. 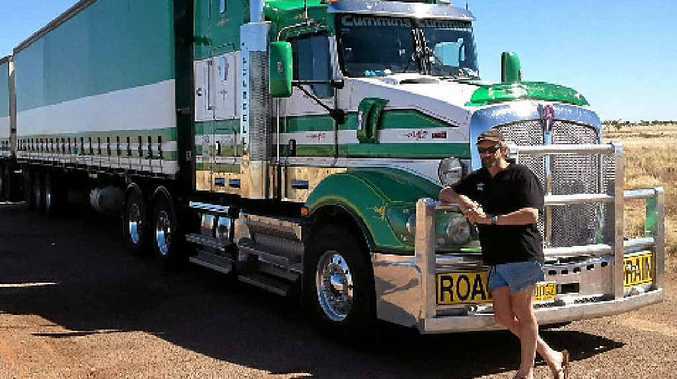 So he re-joined Scarcellas teaming up with his old mate "Slurpy" driving a gas powered T-604 with 700+hp towing road trains from Sydney up to Darwin. But, regretfully, he had to get out of the truck with all the horsepower and step into a brand new T-609 with a mere 600hp CumminsSignature EGR up front, catching a lot of attention wherever they go.